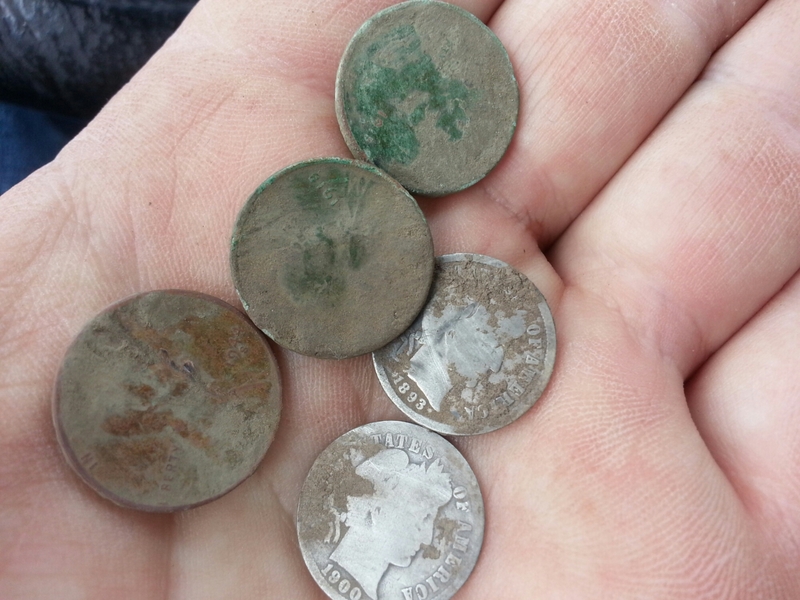 Metal detecting in the woods is still paying off for me. I was cutting through a thick area of small trees heading to an open area with large old trees and the Etrac sounded off. I looked down at the display and it said 9-45. Sweet! As I worked around the spot I was getting numbers like 11-45, 12-47, 7-45 and 10-47. Maybe a silver quarter? So I dug a wide plug and as I flipped the soggy plug I could see a thin silver rim. It was a Merc! I stood up and started getting another silver dime signal and a a low tone mixed in. Yep, a Merc and a Buffalo. I checked the hole again and started getting wheat penny numbers. I pulled two wheats out. I was still hoping a silver quarter was lurking in the ground. Then I started getting goofy numbers between a wheat and zincon. I was surprised to find an Indian head penny. Wow! So this coin spill consisted of a 1923S and a 1916S Mercury dimes, a 1919D Buff, a 1908 Indian and 1919D and 1920 wheat pennies. No Standing Liberty Quarter, bummer. I love finding coin spills. It gives me a glimpse of what someone was carrying at the time they lost the coins. I was surprised finding an Indian head penny, but I guess I shouldn’t be. The dates are not that far apart. All the other coins were found in the woods except for a silver Rosie and a wheat. I found them in a really trashy part of the park where I found a previous silver Rosie. Silver is still there to be found, but I have to be in the right mind set to find it. It’s super trashy and you have to crawl over the ground to pick out a silver. Another observation was the coin spill. The Etrac picked out the silver first despite the other coins in the hole. The first Merc was a little shallower, bit not by much. So I would believe the Etrac is geared for silver primarily. Cool! March has been a real bear for me to find silver coins. You wouldn’t believe the hours I put in to find 3. Luckily I found 2 today or I’d be stuck with just one. I was sweating it. The cool thing was I found a coin spill with a 1929D Mercury dime, 1920D wheat and a no date buffalo nickel. Everything old I found was in the woods except for one Merc, it was picked up in a trashy old park. I’ve been trying the etrac in manual mode and it only works for me in a few places. I’ve only found one old coin using manual and it was a deep wheat. I was still able to pick it up in auto. I’m going to try field hunting this year so maybe it will be beneficial there. I also found an old pocket watch today. It appears to be steel with a plated back. The front was gone and I found the back a few inched away. I was frustrated I couldn’t find the front glass and bezel. Bummer. Good luck to everyone. BTW – Congrats to MDFINDS with finding the silver rosie while it was snowing! The cold has settled in and the ground is frozen. So what to do? I decided to learn how to get the most out of my blog. So my blog will be changing for the better, I hope. I’m learning how to add photos using a mobile WordPress app. Which is good since all my pictures are on my phone. It’s been challenging for me to learn the app. (can you hear the snickers of my children in the background? 🙂 I think I’m finally starting to get the app figured out and my blog is showing promise. Best of luck to everyone and good hunting.